Between a row of familiar green and white GO Train cars lies a vibrant art piece, a moving idea lab, a space for education and conversation. Art Train Conductor No.9 is a mobile public art project that has transformed a GO Train car into a forum for debate on issues of sustainable transportation. It will cover the entire GTA and Hamilton GO Transit network by the end of its five-month run, so keep an eye out on your morning commute. Art Train Conductor No.9 is the product of a collaboration between Metrolinx, No.9: Contemporary Art and the Environment, and Toronto-based artists Jennifer Marman and Daniel Borins. The project encourages the public to engage in a discussion about urban sustainability and public transit while riding the GO Train. 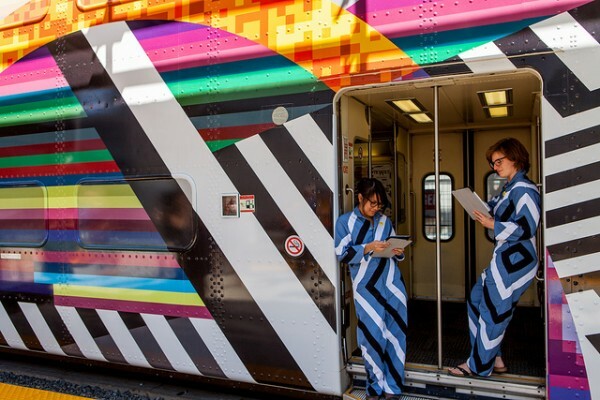 The exterior of the train car has been vinyl-wrapped with a brightly coloured abstract image, designed by Marman and Borins, while the interior has been decorated with similar posters and ceiling vinyl. In addition to the striking visuals on the train, a special mobile app called “tetAtet” has been developed that features videos of urban thinkers discussing transit issues. 8-80 Cities Executive Director Gil Penalosa, Canadian author Margaret Atwood, and Evergreen Co-founder Geoff Cape are featured, amongst others, including Spacing‘s own Shawn Micallef. The app also invites train passengers to contribute to the conversation on sustainable transportation. The goal is to use art to connect both people and ideas. Andrew Davies, Co-Founder and Executive Director of No.9, a Toronto-based arts organization and co-presenter of Art Train Conductor No.9, says that the project aligns with the organization’s mission to provide wide public access to sustainability-focused art and ideas. “No.9 has been thinking for a long time about activating a train as a work of art. It’s the idea of having art in the everyday that people would come across in their daily lives and that would be accessible to everyone,” said Davies. No.9 commissions local artists and designers to create public projects that relate to sustainability and also undertakes educational outreach on ecological issues. “We are interested in building sustainable cities. If we can get our cities right, we can have a huge impact on how we relate to our environment. This project is about promoting public transportation… and celebrating public transit, to make it exciting and fun and to look at it in a new way, using creativity and innovation,” said Davies. By the end of the project, Davies hopes that the public will have meaningfully engaged with the Art Train Conductor No.9 forum. “We are hoping that people will appreciate a real look into what public transportation can be and that they will participate in what the future of regional transportation can look like,” said Davies. Art Train Conductor No.9 launched on June 27th and will be travelling throughout the GO network through December 1st. The tetAtet mobile app can be downloaded at www.arttrain.no9.com. Photo by James Didonato courtesy of No.9: Contemporary Art & the Environment, via rockitpromo.